The CSIR has completed the first phase of its new solar energy research and testing infrastructure. The photovoltaic testing facility, with its outdoor test facility and its indoor reliability lab is the most advanced in the country. The photovoltaic testing facility supports the domestic solar photovoltaic (PV) industry with aspects of industrial development, research, quality assurance, knowledge generation and human capital development. The facility was conceived to support the burgeoning PV manufacturing sector in South Africa as a pre-qualification test facility so that the design, build and test of new products could happen in parallel, shortening the time to market for South African components. The facility also supports the renewable energy industry, specifically on PV module quality, reliability, design, system modelling, operations, maintenance and monitoring. The facility furthermore contributes to knowledge transfer and human capital development through research, publication of results and by training emerging researchers. The growing photovoltaic industry in South Africa will benefit from high-quality research on solar system design and optimisation in realistic outdoor environmental conditions. The testing facility makes it possible to study the performance of PV modules that have been manufactured locally and internationally under real-world South African climatic conditions. It enables laboratory-quality diagnostic measurements on PV modules and small systems of 5 kilowatt of alternating current in a fielded environment. The facility is key in improving model accuracy, optimising on-site battery storage, and analysing the performance of different PV technologies. Contributing to the facility’s uniqueness, is the ability to collect high-resolution measurements of the direct current measurements on module performance at desired time intervals and contribute AC energy (the power accumulated over time) to the building where the facility is situated in between measurements. 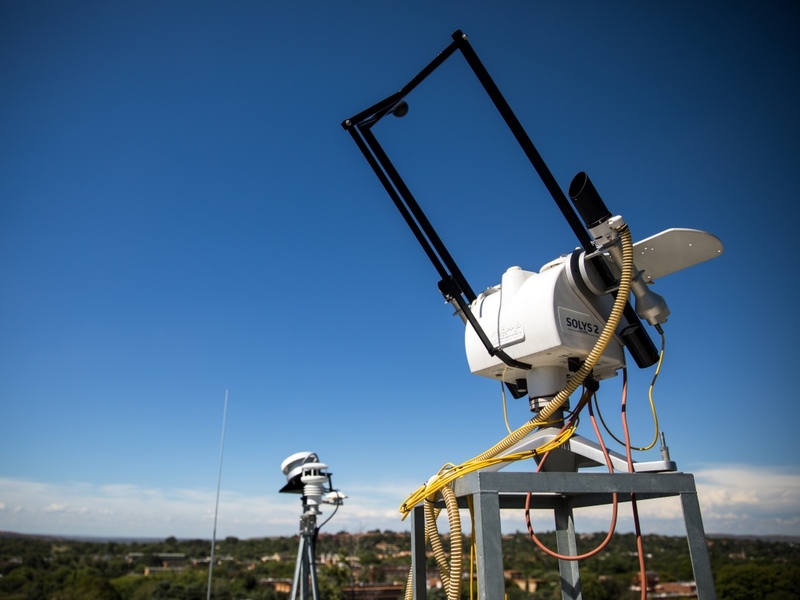 A weather monitoring system forms an integral part of the outdoor testing facility. The outputs of the photovoltaic modules and systems will be measured continuously and their performance is correlated to the meteorological readings. Data derived from the weather system are integrated into the Southern African Universities Radiometric Network for anyone to download. The indoor reliability lab is designed for pre-qualification testing of PV modules and for conducting quality and reliability test protocols that are emerging throughout the global PV market. Indoor lab tests accelerate the learning that can otherwise take years to occur naturally in the field. The data from these accelerated stress tests will help ensure that the right products are developed and installed in South Africa. The environmental and mechanical stress testing in the lab forms the foundation for the pre-qualification of new concepts, certification of new products, and reliability testing of existing technology. Accelerated stress tests shorten the learning cycle for development of new products. CSIR researchers subject the modules to harsh conditions which mimic the actual life-time of the modules which otherwise would have taken up to 25 years. The test facility also supports a standards body such as the South African Bureau of Standards in the development of local standards. 10. Soiling studies on various module types, mounting configurations and anti-soiling solutions.